Edited by Edward Yeung, Claudio Stasolla, Michael Sumner and Bing Huang. Springer, 2015. As one who has wrestled with published protocols to adapt them so that they worked for my material of plant cell biological choice – the cytoskeleton within developing secondary xylem and phloem of tree roots (Chaffey et al., 1997) – I appreciate the importance of user-friendly, step-by-step, detailed guidance from those who’ve developed the techniques. That experience inspired production of the ‘wood cook book’, which presents a wide variety of detailed techniques and protocols for the study of the cell and molecular biology of wood formation in trees (Chaffey, 2002a). Although published protocols and methodologies exist for microscopical study of less demanding plant tissues – e.g. Johansen (1940), Sass (1958), Jensen (1962), Berlyn and Miksche (1976), O’Brien & McCully (1981), Gahan (1984) and Ruzin (1999) – many of them are no longer available. There is also an understandable desire to ensure that methods are relevant for 21st century practitioners of plant microtechnique. And that is one of the drivers for Yeung et al.’s book Plant Microtechniques and Protocols [hereafter referred to as PMP], which is a collection of “a wide variety of applications and brings them up-to-date to make them understandable and relevant, especially to students using the methods for the first time”. PMP is not dedicated to the art of wood microtechnique (though it devotes three of its 30 chapters specifically to the idiosyncrasies of this material). Rather, PMP purports to provide proven protocols and procedures for a more generalist usership, who would probably prefer to investigate the intricacies of such systems as Arabidopsis (which is no less interesting or worthy of study than trees, but generally more amenable to microtechnical study). Of PMP’s 576 (+ xiv) pages, 570 of them are devoted to 30 chapters of techniques, which are contributed by >50 practitioners. Those chapters are grouped into four sections; starting with general – but rather important! – considerations of “Fixation, processing, embedding and staining of botanical specimens”, before dealing with “Microtechnique related to cell and molecular studies”, “Preparative methods for the study of wood anatomy”, and “Botanical techniques and protocols for archeology and herbarium collection”. And each of the methodologies looks pretty detailed (to the extent that there is some repetition between different chapters – but since one probably only reads the chapter of interest this will probably go unnoticed, and ensures that each contribution is truly stand-alone and complete in itself…), which is good, and as it should be in such a practical-based, hands-on volume. Contributions also include appropriate mention of health and safety matters, whether within the laboratory or outside e.g. on archaeological sites. But maybe it is also important to say why the leg of the pants [by which is presumably meant trousers for UK readers…] should cover the upper part of the boot (p. 133) – to stop the tissue-damagingly ultracold liquid nitrogen getting inside the boot and injuring the leg or foot! And, whilst covering up one edge of a double-edged razor blade with a single layer of masking tape (pp. 12/13) is probably enough to stop a student accidentally cutting off a finger(! ), serious harm could still result. So, maybe a few more layers of tape are needed to be on the safe side? But the real gems of the methodologies are the “Notes” and trouble-shooting sections. Provided by the practitioners themselves they make the protocols ‘come alive’, and can save many hours of frustration if trying to work out why a method has failed on your own. Indeed, without such hints and tips the temptation for many is to abandon the techniques if they don’t work that readily, which may mean even fewer workers undertaking this sort of investigation. Generally, there is an Interpretation and Conclusion or Conclusion or General Comments section at end of chapter, which often provide words of encouragement about the chapter’s techniques for would-be practitioners. The book concludes with four 2-columned pages of Index. And, yes, Arabidopsis has several entries therein. But, the only other taxa Indexed are Bienertia sinuspersici, Brassica napus, Kalanchoe, Oryza sativa and Suaeda aralocaspica. I know that many more species were mentioned within the text. A separate list of species used in the various protocols would have been useful – to give the phytocurious encouragement to investigate their own particular species of interest – because the Index isn’t much help in that regard. The various techniques often get good mention in the index, but they can be readily noted from chapter titles (unlike the species…). Black and white and colour images help to illustrate many of the contributions, and some of the multi-colour ones – e.g. re fluorescence, stained hand-cut sections, and tomography renderings – were very impressive. However, I wasn’t aware that the images state the publication they appear in. Maybe they’ve been created specifically for this book? I suspect not in all cases, so it would be useful to have that link to the published literature – as extra evidence of what can be achieved with the techniques. References are provided at the end of each chapter (there is a limit to how much even the most detailed protocol should repeat of that which is in the public domain already, after all). However, they are not listed in author order, but in numerical order (as cited in-text). Harvard referencing – especially in-text – would have been a blessed relief from the numeral-heavy protocol listings. But some strange items are included in the References, e.g. Chinnappa CC (1980) Botany 441: Taxonomy of flowering plants lab manual. University of Calgary, and Mitrow G (2014) Personal communication. It should surely be a golden rule that lists of references only include items that are publicly-available. I tried hard to locate the first item on the internet – and failed. That item cannot therefore really be considered available to all. How important it is to understanding the related chapter I’ll never know. Similarly, a personal communication is what it says, a communication that was personal to the two parties; such items by their very nature are not available for access to others and should never feature in lists of references. Whilst space does not permit coverage of every protocol in the collection, a few are worthy of some additional comment. Chapter 1 “A Guide to the Study of Plant Structure with Emphasis on Living Specimens” by Yeung: it was a pleasure to see the free-hand sectioning technique given such a great boost in this contribution. And a mention of Peterson et al. (2008), which gives even more details about the technique and what is possible. And nice too to see similar promotion in Chap. 10 “Improved Methods for Clearing and Staining of Plant Samples” by Lux et al. Hand-sectioning is such a quick – and cheap! – way of getting results and providing an entry into the world of plant microtechnique that it is a shame it seems so rarely used. The more so when what is possible is so well showcased in Kraehmer H and Baur P (2013). Chapter 2 “Chemical and Physical Fixation of Cells and Tissues: An Overview” (Huang and Yeung) has to be mentioned because it perpetuates the myth that tissue blocks with sides no more than 1 mm cubes are needed re fixation for transmission electron microscopy. This is not true for woody material – where some cells can be >3 mm long (e.g. Chaffey, 2002b), and to some extent contradicts PMP’s Chap. 24 “Three-Dimensional Imaging of Cambium and Secondary Xylem Cells by Confocal Laser Scanning Microscopy” by Nakaba et al. re wood studies where 30 x 10 x 2 mm slivers are used. I know PMP isn’t just about woody tissues, but this caveat deserves to be mentioned. Purely because I don’t recall seeing much detail about the technique anywhere else, it was nice to see Chap. 20 “Laser Microdissection of Plant Tissues” by Millar et al. Chap. 22 “Microscopic Examination of Wood: Sample Preparation and Techniques for Light Microscopy” provides a great addition to, and development of, a similar chapter by Chaffey (2002c). Plus, it’s always nice to see woody tissues recognised for the technical challenges they pose, and being given appropriate mention in a more generalist plant microtechnique volume. As the editors acknowledge in the Preface, PMP is not a complete list of plant microtechnique methods (thereby paving the way for updated future editions…), so it would be churlish of me to list all of the topics I might like to see in such a book. However, one section that would have been useful is one that deals with the issue of recording and preparing images for publication. Image is everything in microtechnique and often represents that main output of a research project. Given the number of retractions of published articles because of image ‘manipulation’ (e.g. Martin and Blatt, 2013; http://retractionwatch.com/2016/02/24/dont-trust-an-image-a-new-company-can-help/), a chapter that sets out what is permissible – and what is not – would be timely. I’ve mentioned the usefulness of a list of taxa above. Although addresses of the contributors are provided, eMail addresses are not. Whilst these may change – as may physical addresses of the authors – they would be extremely useful if would-be users of the techniques had queries they’d like to raise with the protocol’s providers. This is a relatively simple gesture that can help to ensure wider take-up of plant microtechnique (and declaredly one of the aims of the book). The broad area of plant microtechnique is an innovator’s paradise and techniques will continue to improve or be modified to suit the needs of different plant material and specific research goals. PMP is therefore neither the last – nor necessarily the latest – word on the subject – as the Protoplasma Special Issue on Emerging Techniques in Light and Electron Microscopy (Borst and Robinson, 2014) shows. And, encouragingly, there is a healthy interest in developing protocols for plant microtechnique as exemplified by such sites as Nature Protocols, Protocol Exchange, BMC Plant Methods, and Springer Protocols. 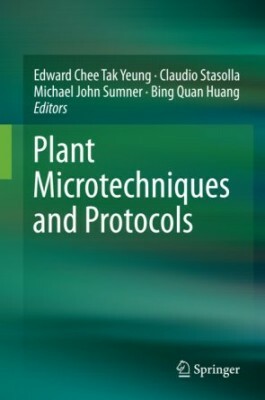 Plant Microtechniques and Protocols is nonetheless an important and welcome collection of protocols that capture the current state of part of the art. However, the true test of PMP is how well it will be used – and cited! – by researchers of the future. Therefore, and as one who’s been involved in a similar project that sought to encourage more interest specifically in the cell biology of wood plants, I wish Yeung et al. well in their worthy endeavour to develop the next generation of structurally-minded plant scientists. Berlyn GP and Miksche JP (1976) Botanical microtechnique and cytochemistry. Iowa State University Press. Borst JW and Robinson D (2014) Editorial for PROTOPLASMA — Special Issue on Microscopy. Protoplasma 251: 273–275. Chaffey NJ (ed.) (2002a) Wood formation in trees: Cell and molecular biology techniques. Taylor and Francis. Chaffey NJ (2002b) An introduction to the problems of working with trees. In: Wood formation in trees: Cell and molecular biology techniques, ed. Chaffey NJ, pp. 9-16. Taylor and Francis. Chaffey NJ (2002c) Wood microscopical techniques. In: Wood formation in trees: Cell and molecular biology techniques, ed. Chaffey NJ, pp. 17-40. Taylor and Francis. Chaffey NJ, Barnett JR and Barlow PW (1997) Visualization of the cytoskeleton within the secondary vascular system of hardwood species. Journal of Microscopy 187: 77–84. Gahan PB (1984) Plant histochemistry and cytochemistry – An introduction. Academic Press. Kraehmer H and Baur P (2013) Weed Anatomy. Wiley-Blackwell. Jensen WA (1962) Botanical histochemistry principles and practice. WH Freeman and Co.
Johansen DA (1940) Plant microtechnique,1st edn. McGraw-Hill Book Co. Ltd.
Martin C and Blatt M (2013) Manipulation and Misconduct in the Handling of Image Data. The Plant Cell 25: 3147-3148. O’Brien TP and McCully ME (1981) The study of plant structure principles and selected methods. Termacarphi Pty Ltd.
Peterson RL, Peterson CA and Melville LH (2008) Teaching plant anatomy through creative laboratory exercises. NRC Press, Canada. Ruzin SE (1999) Plant microtechnique and microscopy. Oxford University Press. Sass JE (1958) Botanical microtechnique, 3rd edn. Constable and Company Ltd.